JANUARY 21, 23 AND 24 7:00 P.M. - 8:30 P.M.
JANUARY 24 2013,2012,2011,2010, 2009,2008, 2007,2006 AND 2005. The Mission of SDRMElite is to develop successful, well-rounded individuals who will exhibit good sportmanship, ethical and moral behavior as well as good citizenship. 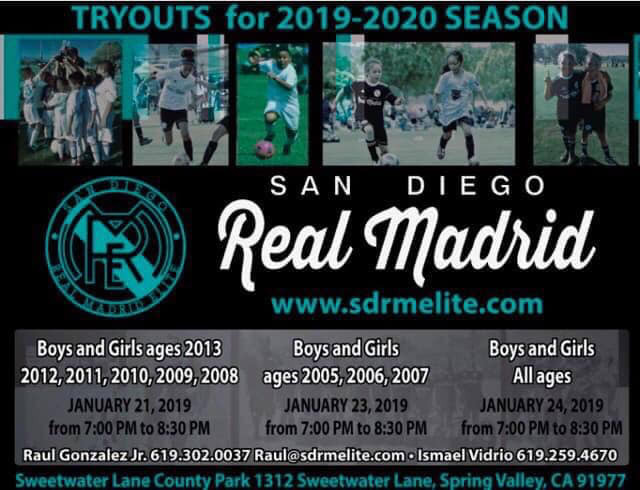 We aim to leverage the challenges on life lessons of striving for excellence in competitive soccer into molding young people to understand the value of teamwork, sportmanship and work while fostering an environment that allows players to reach their full potential and love for the game. © SDRM Elite. All rights reserved.